Joe Slovo squatter camp was the scene of an intended illegal demolition of shacks by Johannesburg's Department of Housing in April 2013, but Children of Fire sourced the community a pro bono lawyer who brought matters to a halt. Then on 20th April 2013 some of the shacks previously facing demolition burned down. 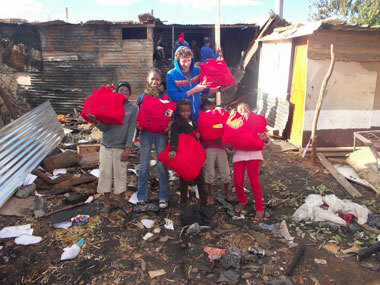 13 families were left destitute but again Children of Fire was there within hours with more than 50 blankets, a disaster recovery bag for each family, some food and clothes, especially for the children. The value of our help on 21st April was at least R7500. Photo includes UMashesha volunteers Matt Rose and Feleng Mahamotse. In 2013 as in the previous decade and more, Children of Fire has continued to help the people of Joe Slovo squatter camp on the edge of Coronation and Crosby in Johannesburg. While the community has easily doubled in size in the time we have worked there, that population growth has its pros and cons. One good thing is that recycling has become a viable business and there is a significant group of people collecting discarded plastic, glass and tin for its resale value. A cleaner planet, husbanding of resources, and feeding poor people at the same time.